The Definitive Twitter Guide is a must-have for contemporary marketers. Author Shannon Evans provides a substantive, thoughtful description of how the market has evolved to a place in which 140-word messages, carefully crafted and frequently sent, can establish, communicate, and reinforce a company's reputation. The Definitive Twitter Guide: Making Tweets Work for Your Business: 30 Twitter Success Stories From Real Businesses and Non-Profits by Shannon Evans (CreateSpace, 2010). 244 pages. If a company is avoiding Twitter, Facebook, and a robust, interactive web presence, chances are they are watching with growing frustration as their competitors the social media tools gain and serve customers. “Twitter? Facebook? It just doesn’t make any sense,” one business owner I know, firmly “old school,” frets. Because she doesn’t understand why it works, much less how it works, she’s not going to do it—even though she can see it’s helping her competition. No amount of nagging or shaming or prodding is going to work here. But something that lets her see behind the fairy dust to the real-world mechanics of how and why Twitter works just might do the trick. 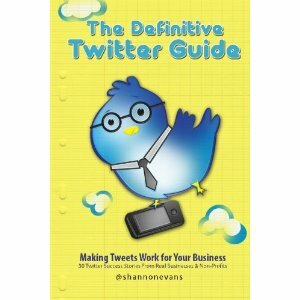 That’s where Shannon Evans’ new book, The Definitive Twitter Guide — Making Tweets Work for Your Business, comes in. Evans does an outstanding job of stepping outside the often self-congratulatory world of social media and approaching Twitter from the viewpoint of an established business professional. This is a great help to anyone who needs to assess the value of Twitter and social media work in relation to the value of their other PR and marketing activities. In short, The Definitive Twitter Guide is a must-have for contemporary marketers and business owners—even if all they want to do is figure out what their competition is up to. You’ll find it on Amazon ($19.99) and also in ebook form.